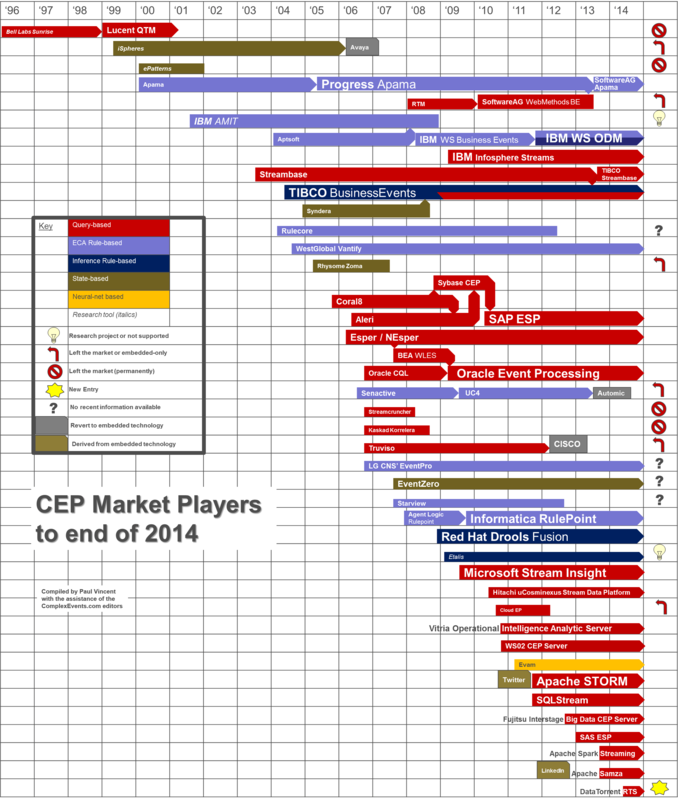 This CEP Market Players Survey covers most of the history of CEP / event correlation tooling up to the last month of 2014. It incorporates input from (and with thanks to) Roy and Opher on some of the recent market shifts and tool histories. There continues to be strong interest in the open source Apache Storm, Spark Streaming and now Samza, and these may well mature into commercial offerings in future and/or get embedded in existing commercial product sets. Yet despite this, all the major (IBM, Oracle, Microsoft, SAP) and many medium (SAG, Informatica, TIBCO, Red Hat) software vendors now have good to excellent offerings, indeed sometimes multiple offerings, in the CEP space for customers to build business-real-time event-based applications. 6 Responses to "CEP Tooling Market Survey 2014"
Storm and Samza, just to pick two examples, are distributed stream processing frameworks, and not Query-based CEP tools (red category). Both Storm and Samza don’t offer a query language. I think it would be more appropriate to add a new category “green” for DSCP platforms. Esper is a Query CEP tool and runs within Storm and Samza (see https://github.com/tomdz/storm-esper). Or better yet create a separate chart for pure-play DCSP platforms. Don’t perpetuate the myth that DSCP = CEP. Fujitsu Big Data CEP server is Esper. For confirmation please review the public product documentation. Thanks bernhardttom – yes I concur, we need a new category for such frameworks that provide more “divide and conquer” distribution abilities over complex event operations per se. I’ll look into this some more. And thanks for the steer on Fujitsu. Shouldn’t this have kdb on it?